I got this new gadget a while back but I haven't had a chance yet to play with it. 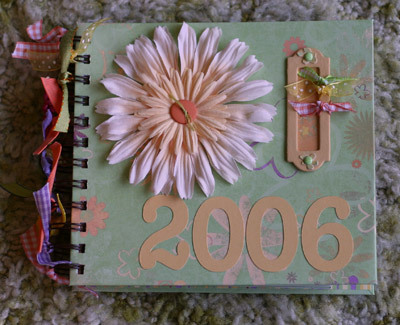 I decided to make a 2006 scrapbook for my Mom's birthday so I made this little album. I used some old Deja Views fresh prints 6x6 papers I had been hoarding. I stuck each page to some cardstock (front and back) and then put a tab on each to make turning the pages easier. Here is a picture of the inside to show how I used the tabs. I used the Stampin Up tab punch to make the tabs. I love this punch. For the covers, I used some matboard covered with some fresh prints papers I had in 12x12 size. I used a 7/8" binding coil and it seems to be just the right size for this. That's the bad thing about having a binding machine-you don't know which size coils you'll need. I only had two 7/8" and two 5/8" so I'll have to get more coils eventually. Anyway the flower on the front is from Prima, the button is (I think) from Bazzill, the little frame thingy is from Stampin Up, the brads are from Queen and Co. and the ribbons are from all different places. The numbers were cut out of Stampin Up cardstock with the Craft Robo. Awesome job, Gale! I absolutely LOVE this...and you evil little enabler you....I just HAVE to have that punch too, now! :) One of these days I will get my BIA out of it's box!